Since 2008, cars in Quebec are required to be equipped with tires specifically designed for winter driving from December 15th through to March 15th. If you don't install four winter tires on your vehicle and get caught the fines are hefty too, ranging from $200 to $300. Who is affected by the Quebec winter tire law? It's estimated that 4.5 million vehicles are affected by the law annually as all passenger vehicles, taxis and rental cars registered in Quebec must be equipped with winter tires. Visitors who drive to Quebec from out-of-country or out-of-province are not affected by Quebec's winter tire law as their vehicle would be registered and plated by their home jurisdiction. The law only applies to passenger vehicles registered (or rented) in Quebec. Even though an advertisement may claim that the tires are suitable for winter driving, if they are not marked with a specific designation they are not considered a winter tire under Quebec's winter tire law. Since December 15, 2014, only tires with the mountain snowflake icon, or studded tires, are recognized as acceptable winter tires in Quebec. Don't think of them as winter tires, think of them as cold weather tires. Colder temperatures decrease the elasticity of the rubber, resulting in reduced traction. Don't wait for the deadline to install your winter tires. 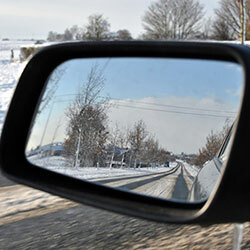 A good rule of thumb is to put your cold weather tires on when the temperature is consistently 7° Celsius or colder. Install four winter tires, the law requires it and installing just two can be unsafe. According to the Rubber Association of Canada, "Installing only two winter tires on the rear of a vehicle will lead to unwanted and sometimes surprising handling characteristics." And, when it comes to putting just two winter tires on the front, they say you should never do this as it is "particularly dangerous and could result in a complete loss of control." Don't mix and match winter tires. While it may seem more cost effective to replace one or two tires at a time, having mismatched tires can lead to rapid and uneven tread wear, or even mechanical issues. Check your tire pressure monthly. Tire pressure decreases as temperatures drop, and tires not properly inflated may not accelerate, brake or steer properly. Additional information about Quebec's winter tire law can be found at the Société de l'assurance automobile Québec, and if you're looking for more details about winter tires in general, visit Transport Canada or The Rubber Association of Canada. In a nutshell, install four winter tires before the deadline each year to stay safe and avoid tickets. While your safety is the priority, a ticket for not having your winter tires installed could hit you twice in the wallet: first from the fine itself, and second because it may also affect your Quebec car insurance rate.